In the world of sports betting, it doesn't get any more significant than the big game. LAS VEGAS (KTNV) — In the world of sports betting, it doesn't get any more significant than the big game. "I think this year's game is going to be the biggest Super Bowl ever," said Derek Stevens, owner of The D Las Vegas. Bettors favor football more so than any sport, so football's biggest game means big money, too. "It's our biggest wagering event of the year," said Jay Kornegay, of Westgate SuperBook. Last year, more than $150 million was wagered on the Super Bowl in Nevada, which eclipsed the previous year's record by $20 million. But a lot has changed since last year's big game. In May, the Supreme Court of the United States ruled in favor of New Jersey, overturning a previous ban on sports gambling and paving the way for states across the country to make it legal. Right now, there are eight states (including Nevada) with legalized sports gambling in one form or another, two states that recently passed bills and 17 more that have bills introduced but not passed. So, while analysts and bookmakers expect Nevada to set another record this year, the other seven states will get a piece of the pie too. "I projected between $162 and $174 million [in Nevada]. The question is: how many of the people that are on the East coast that usually come out to Vegas will be staying home now that sports betting is legal in their state," said Dave Tuley, senior reporter at VSiN.com. Tuley said he projected the total amount wagered nationwide on the Super Bowl to be around double that of last year - $320 million. 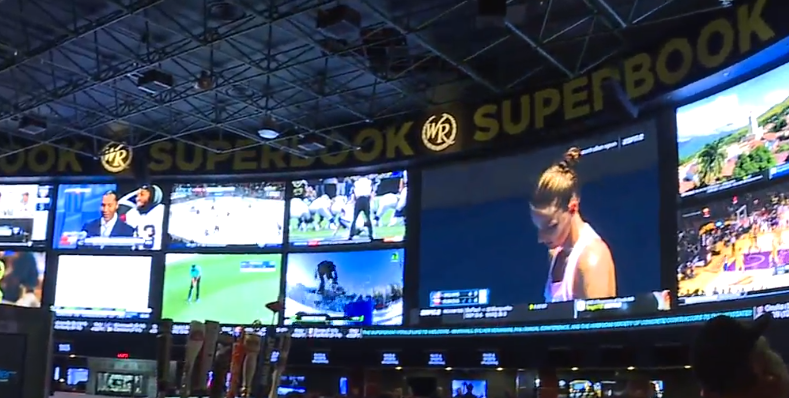 But the question of whether Vegas sportsbooks will take a hit as other states jump on the betting bandwagon is real, but Kornegay said he's confident in what Westgate and Vegas have to offer. "The studies we've looked at - there are very few people who just come out to Vegas to make a sports bet," said Kornegay. "They come out to enjoy all the festivities." And Vegas knows a thing or two about festivities. Just north of Westgate, the Downtown Las Vegas Events Center will play host to an estimated 7,000 people on Super Bowl Sunday. Owner Derek Stevens said even with more states legalizing gambling; there's something untouchable about Vegas. "We got this beautiful weather, this beautiful sunshine," said Stevens. "We got all the right sportsbooks. And there's just so much action here. Vegas is the hub of sports betting." The Las Vegas Convention and Visitors Authority won't have their projections for the Super Bowl until early next week, but last year, an estimated 300,000 visitors spent about $400 million in town.